How to Fail at Almost Everything and Still Win Big? 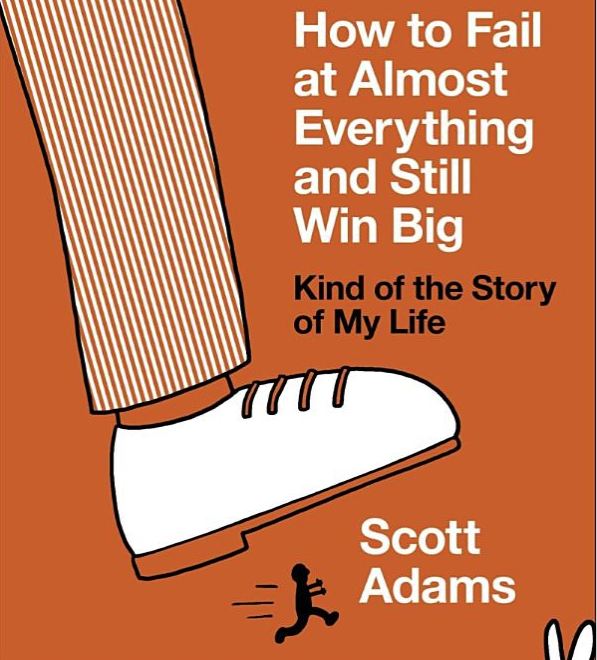 This is the book written by Scott Adams, creator of a famous comic strip Dilbert. Scott Adams had failed at many things, but still achieved great success. In this book , Scott tells the semi-entertaining tale of how did he go from a series of failures to a successful cartoonist. He shares many good strategies that we can apply in our life to be healthy , happy and successful. Failure is the raw material of success. Invite it in. Learn from it. The most important metric you want to track is your personal energy. Luck is important, But you can create a system and opportunities that allows luck to find you. Process is more important than goals. Don’t set goals, but create systems. The system will help you to continuously look for better options. For e.g In business, making a million dollars is a goal, but being a serial entrepreneur is a system. Your first priority should be increasing your personal energy. Take care of yourself first, don’t think it’s selfish. Good exercise, food, sleep and spending quality time with your family are the ways to raise your personal energy. Manipulate your brain chemistry to be Happy. Person with a flexible schedule and average resources will be happier than a rich person who has everything except a flexible schedule. Work towards flexible schedule. Slow and steady improvement at anything makes you feel that you are on the right track. We tend to feel happy when things are moving in the right direction and unhappy when things are trending bad. Simply imagining a better future hacks your brain chemistry and provides you with the sensation of happiness today. Being happy raises your energy level and makes it easier to pursue the steps toward real-world happiness. Know success patterns to increase your odds of success. Follow Stephen. R. Covey’s — [The 7 Habits of highly effective people](https://amzn.to/2HQbVzi). Learn useful skills like public speaking , business writing, understanding of psychology, basic persuasion technology. Small successes can grow into big ones, the quality didn’t predict success. Affirmations are no more special than any form of positive thinking, prayers, visualization, chanting, or the like. They would presumably put a person in a more optimistic mind-set. Whether you are a born optimist or you become one through affirmations, prayer, or positive thinking, you end up with several advantages that make it easier for luck to find you. Create a system involves generating lots of opportunities for luck to find you. In Scott’s view, All success is luck if you track it back to its source. You can make yourself lucky. if you stay in the game long enough, luck has a better chance of finding you. To change yourself, part of the solution might involve spending more time with the people who represent the change you seek. The people around us give us information we need, or encouragement, or contacts, or even useful criticism. We can’t always know the mechanism by which others change our future actions, but it’s pretty clear it happens, and it’s important. A child who eagerly accepts the risk of embarrassment in front of a crowd — even a friendly crowd — probably has some talent for entertaining. Take the sort of risks that will allow you to come out ahead even if the project fails. For e.g Bill Gates famously found ways to hone his technical skills by stealing time on a mainframe. Success causes passion more than passion cause success. Perceptions is that you shouldn’t hesitate to modify your perceptions to whatever makes you happy, because you’re probably wrong about the underlying nature of reality anyway. If you enjoyed this post, Please clap so that it will reach more audience. I will publish more summaries like this in Book Insights Publication. If you like to read more, follow that publication so that you will notified on new stories. Distilled insights from great books.